Today I travelled up to London from Wales to the sacred synod in Westminster. There were a large number of Welsh clergy there with many hundreds from England. We were told by Dame Mary Tanner that we were still in a period of 'reception' over the issue of women priests and bishops! Cuckoos in the land of the clouds came to my mind. When are people going to accept this massive defeat gracefully and move forward without bitterness or retribution and leave fantasy dreams behind? If you stay you accept what is the reality in the new protestant C of E and Church in Wales or you go; or you stay as many will have to and go later (an honourable position) but the scared rabbit caught in the headlights approach, pretending that we can get something more out of the carnage of defeat looks pretty unseemly to me. Yes, we must accept that some of us are moving in different directions or in the same direction at different speeds but a little clarity of thinking will see that there is no jurisdiction, there is a code of practice and it will not do! Tell my Welsh clergy colleagues without a bishop for two years that we are still in 'reception' over the issues and they won't be very pleased. 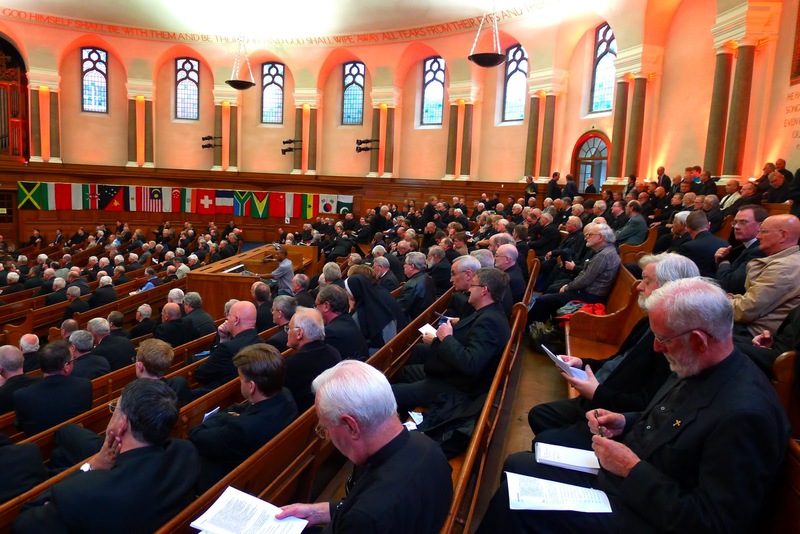 The majority of English clergy of our tradition can see the huge defeat that is a reality and that the Act of Synod will be revoked and that there will be no provision for them either. Despite a clear rejection by general Synod of a religious Society model with jurisdiction, the last ditch effort from some today appears to be reviving this idea. However, there is no clear thinking or plan or detailed and thought out proposal. Even those who promoted it seemed to admit that it won't work! I felt very sad to see intelligent hard working priests and a couple of Bishops trying to work something out on the hoof. I was not a little annoyed at the leaflets and promotions of this ill thought out and already rejected idea being canvassed. Today Bishops John Broadhurst, Andrew Burnham and Keith Newton declared publicly their clear intentions to join the Orinariate (perhaps the Bishop of Fulham on a slightly different time scale). Those who want to support them and the Holy Father's clear offer of sacramental and ecclesial unity will I'm sure give them great support either now or a little later when they can. If you're not wanted I can't see how you can plan to stay and pretend to go along with the new regime which is not the catholic church in England and Wales any longer. I understand what you are saying Father but to admit defeat and walk away is premature while elections for the new Synod are in progress however pathetic the gesture may appear. For some, perhaps many, the 'new protestant C of E and Church in Wales' may be all that is left for them. Information coming out of Wales suggests little enthusiasm so far for the Ordinariate except in isolated pockets. Opportunities should be better in England but I have yet to read any detailed proposals that justify the current wave of enthusiasm. I hope it is justified but if there is no 'Ordinariate near you', what is one to do? Attempting to get a lifeboat into the water may appear futile but it may provide the only home for those who are unable to make it shore. I think your words 'pathetic gesture'are better than mine! Of course I don't want to demonise anyone going a different route. I just think it is a cul de sac(dead end) and you can see the sign before you even enter the road. My worry is that the Society will deflect and reduce the take up of the generous offer of Pope Benedict. I agree there are many unanswered questions on that but we have to be patient with Rome and keep faith.